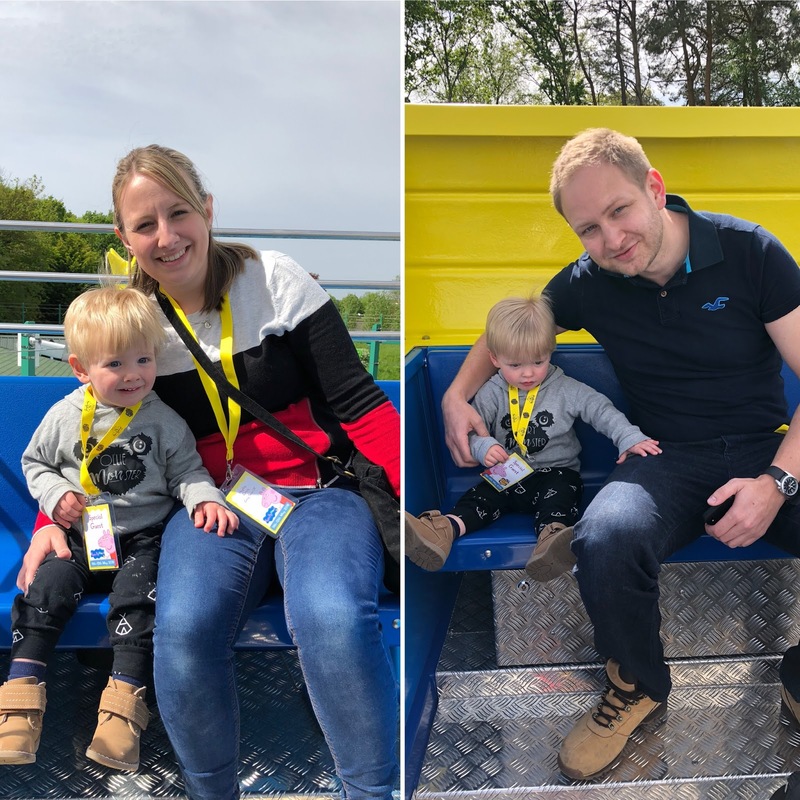 We were fortunate enough to be invited to the preview event at Paultons Park. 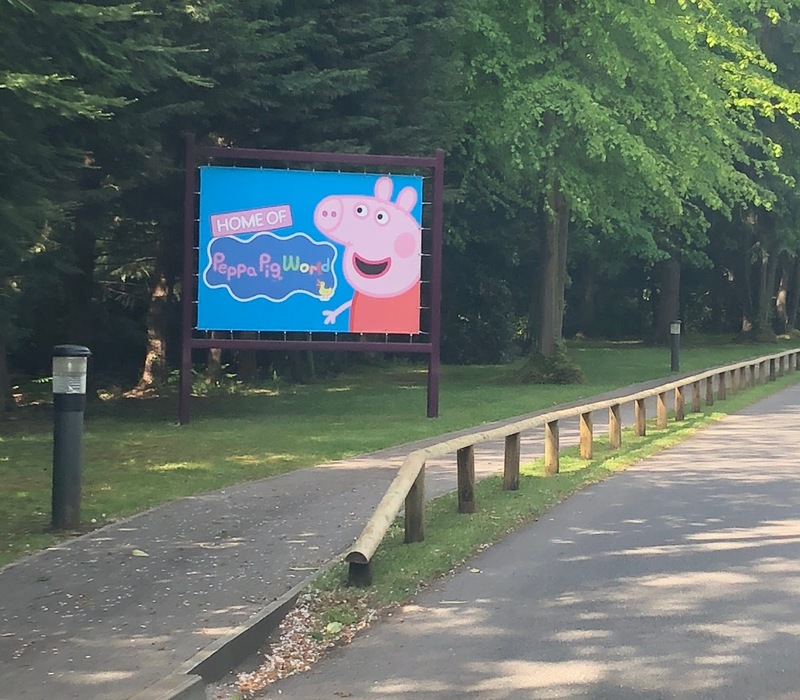 Since Peppa Pig World originally opened in 2011, it has become vastly popular. The decision was made to carry out an expansion, and adding two new attractions and add the additional characters that have been added to the series since opening. When we were initially invited I was unsure of how much the twins would get out of a theme park. They are now 20 months, and I thought they'd be buggy bound for the day. After some research I realised that in fact it was designed for children 1 - 6 years old. We are based just north of London, so aimed to leave at 7.45. Of course in true Craig family style we actually left at 8am. We had been telling the boys that we were going to visit Peppa Pig at Peppa's house. I know they had no idea what I was talking about, but it made me feel better. We stopped on route for a mandatory McDonald's Breakfast, but we did the journey in less than 2 hours. We were at the gate for 10am opening. From the second we walked through the door I couldn't believe how friendly the staff were. One walked past us at the entrance, and could see we were taking it in turns to have a photo with the boys. He offered without hesitation to take a photo of us all. This level of interaction continued all day. After a couple of photos we headed straight for Peppa Pig world. I watched the boys faces intently, and the moment they saw 'Cousin Chloe' it was a game changer. The expression of pure joy won't ever leave me. We got them out their buggy, and they walked from character to character in complete disbelief. Then they saw Peppa and George in the fountain and they looked as if all their dreams had come true, looking at me and pointing, as if to say "mummy, are you seeing this too?". They then spotted the park area, and we let them go off and explore. Usually I feel anxious in play areas, but everything was geared up for their size and ability. At 10.30am the preview area opened and we headed to 'Grampy rabbits sailing club' where little boats (seating 4) sail around a lazy river. If you haven't already gathered I'm a bit of a worrier. I was worried that the wouldn't sit still or would cry etc, but they absolutely loved it. They pointed and danced along to the music. We recognised the wheels of the bus, so mummy and daddy sang along. How many more years are we going to get away with the boys thinking we are the coolest parents ever? After we headed to the other new attraction 'The Queen's flying coach ride'. It was a lovely monorail attraction travelling around the new area. The boys enjoyed looking over and pointing at everything. I loved that it lasted a good length of time. There's nothing worse than queuing up and it only lasting a few seconds. Literally everywhere you look there is something to see. Perfect for my two energetic toddlers! For example one of the new editions is Mr Bull digging the road. Every time the water sprayed from the burst water pipe the boys giggled and loved it. We stood in front of the railings watching for quite some time! We then went to explore the original rides. We couldn't believe how many rides they could actually go on. Although queuing was a new concept to them we enjoyed every one. 'Trekking Tractors' was the boys favourite, so we rode it a few times. It's no secret that I'm bit of a clean freak, and I usually hate nappy changing facilities, but they were the cleanest, most spacious I've ever seen. Every mat had a clip to keep your babies safe. There was a feeding area, and a microwave. I was incredible impressed. I hope visitors go on to keep them nice. I had heard before going that eating within the park was going to be expensive. As we were planning to leave early I didn't want to take a picnic that might overheat, so I thought we'd risk it. We headed to 'The Queen's Kitchen'. They served light bites. We went for a cheese and onion pasty, and a chicken tikka pasty. They were about £3 each. Crisps were £1 a bag etc. Obviously when comparing it to Gregg's it seems pricey, but when comparing it in relation to lunch at Costa it seems more relevant. The food was really nice too! We debated whether to take in the double buggy, and I'm so glad we did. There is still a fair bit of walking and perfect for nap time. There is plenty of space to park your buggy whilst going from ride to ride. When the boys were napping we decided to go and explore the other side of the park, where they wouldn't be so distracted. We walked around the gardens to get them to sleep, and they so peaceful. You can definitely see the time and effort that goes into keeping that area so beautiful. We then found a quiet picnic area to sit whilst the boys continued to sleep, before heading back to Peppa Pig World. The park didn't close until 5pm, but by 4pm the boys were tired and whiney, so we headed to our hotel. We could have driven straight home, but we decided between needing dinner and then hitting rush hour Friday traffic it was worth it. We were so close to the new forest, and nice beaches we could then make a weekend of it. There is a Premier Inn located literally minutes from the entrance, and advertises itself as being super child friendly. We checked in, and after a small kerfuffle with sorting out the cots that should have been in our room, we headed for something to eat. We headed to the 'Hungry Horse' attached to the hotel. This unfortunately wasn't up to the same level of customer service we'd experienced all day. There was a sign by the door saying 'Please wait to be seated'. We waited and waited.. with two hungry toddlers running in separate directions. In the end we seated ourselves. We ordered, and bits were missing from the kids meal. After 45 minutes and repeatedly asking for it, I decided to give up. The boys were getting fractious and it wasn't worth the parenting stress. We had debated going there for breakfast the following morning, but that made our decision for us. After we took a little drive after dinner to the closest marina to see some boats. I was really surprised how much the boys liked looking at them. The following morning we decided to head to Bournemouth, for breakfast and the typical British seaside fun. We walked around the amusement arcade, and put a few 2ps into the machines. I'm not sure if the boys were sensitive due to their disturbed night, but they didn't like the noise(aka screamed the place down). It was fine initially then someone started playing the basketball game, and all hell broke loose. We swiftly exited, and headed down to the beach. The boys dipped their toes in the FREEZING sea, and ran along the sand. We had a lovely weekend, and will definitely return. Peppa Pig World surpassed all our expectations. We were expecting a cheap amusement park, and it really is up there with all the other main UK theme parks. I can tell the boys had a wonderful time, and they have loved watching back the footage and looking through the photos. Next time I'd probably stay overnight in Southampton or Bournemouth, as there isn't much else around. And I'd certainly stay clear of Hungry Horse's from now on. Thank you so much to Paultons Park for having us, and we hope to see you again very soon!